For other places named High Point, see High Point (disambiguation). Location in Guilford County and the state of North Carolina. High Point is a city located in the Piedmont Triad region of the state of North Carolina. Most of the city is located in Guilford County, with portions spilling into neighboring Randolph, Davidson, and Forsyth counties. High Point is North Carolina's only city that extends into four counties. As of the 2010 census the city had a total population of 104,371, with an estimated population of 108,629 in 2014. 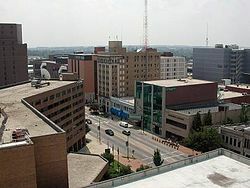 High Point is currently the ninth-largest municipality in North Carolina, and the 259th largest city in America. High Point is known for its furniture, textiles, and bus manufacturing. The city is sometimes referred to as the "Home Furnishings Capital of the World". The city's official slogan is "North Carolina's International City" due to the semi-annual High Point Furniture Market that attracts 100,000 exhibitors and buyers from around the world. It is home to one university, High Point University, a private Methodist-affiliated institution founded in 1924. Among the first Europeans to settle Guilford County were English Quakers and German immigrants. High Point was located at the highest point of the 1856 North Carolina Railroad between Charlotte and Goldsboro where it intersected the 1852 Great Western Plank Road. Its central location and transportation allowed for the delivery of raw materials like cotton and lumber and processed goods in and out of the city and contributed to its early growth. Settled before 1750, High Point was incorporated in 1859. Before it became a major manufacturing center, the most important industries were tobacco, woodworking and textiles. The first of many High Point furniture factories was opened in 1889. Established in 1924, High Point University is a liberal arts institution with approximately 4,400 undergraduate and graduate students from 51 countries and 46 states. It is ranked by U.S. News and World Report 2013 edition of "America's Best Colleges" 1st among comprehensive universities in the South and in the top 100 nationally. The university offers 44 undergraduate majors, 10 graduate-degree programs and one doctorate program. It is accredited by the Commission of Colleges of the Southern Association of Colleges and Schools, and is a member of the NCAA Division I and the Big South Conference. The John H. Adams House, High Point Central High School, Deep River Friends Meeting House and Cemetery, Enterprise Building, First Baptist Church, Dr. C. S. Grayson House, Guilford County Office and Court Building, John Haley House, Hardee Apartments, Highland Cotton Mills Village Historic District, Allen Jay School Rock Gymnasium, Kilby Hotel, O. Arthur Kirkman House and Outbuildings, Model Farm, Eli Moore House, Oakwood Historic District, William Penn High School, Sherrod Park, J. C. Siceloff House, Spring Hill Methodist Protestant Church Cemetery, Spurgeon House, A. E. Taplin Apartment Building, Tomlinson Chair Manufacturing Company Complex, Uptown Suburbs Historic District, Washington Street Historic District, West High Street Historic District, and Lucy and J. Vassie Wilson House are listed on the National Register of Historic Places. High Point is the only city in North Carolina that exists within four counties: Davidson, Forsyth, Guilford and Randolph. It also stands within two major watersheds: the Yadkin–Pee Dee to the west and the Cape Fear to the east. Parts of the city rise above 1,000 feet (300 m), making it among the highest cities in North Carolina's Piedmont. High Point is located at 35°58′14″N 79°59′51″W﻿ / ﻿35.97056°N 79.99750°W﻿ / 35.97056; -79.99750. It is bordered by the city of Greensboro to the north, Jamestown to the northeast, and Archdale to the southeast. The city limits of Trinity and Thomasville come within half a mile of the High Point city limits to the south and southwest, respectively. According to the United States Census Bureau, the city has a total area of 55.4 square miles (143.6 km2), of which 53.8 square miles (139.3 km2) is land and 1.7 square miles (4.3 km2), or 2.96%, is water. Summers are hot and humid, and the dew points will often climb to near or even above 70 °F (21 °C) by late June through much of August. Nights usually remain warm above 70 degrees. Most summers the hottest day will record a maximum between 96 and 98 °F (36 and 37 °C). About once every 5 to 10 years the city will climb to or above 100 °F (38 °C). Winters are cool to cold. Nights average near 30 °F (−1 °C), with the coldest averages in the upper 20s from late December through early February. Most winters the coldest temperature will dip to between 10 and 15 °F (−12 and −9 °C). About once every 10 years the minimum will dip below 5 °F (−15 °C) and to near or below 0 °F (−18 °C) approximately once every 20 years. Daytime highs average near 50 °F (10 °C) in the winter, with the coldest stretch between late December through early February with highs averaging in the upper 40s. Most winters there will be 2 to 4 days that remain below freezing. The hottest temperature on record for the area was 103 °F (39 °C) on August 18, 1988 (in nearby Greensboro the high reached 104 °F (40 °C) in 1914), and the coldest was −8 °F (−22 °C) on January 21, 1985. Rainfall patterns are generally spread evenly throughout the year, with between seven and eleven wet days per month. The city averages around 43 inches (1,100 mm) of rain per year. Snowfall varies from year to year, with most years totaling less than 5 inches (13 cm). However, there are some years that exceed 20 inches (51 cm), and this brings the overall average to more than 8 inches (20 cm) per year. In the winter of 1959/60 the city had just over 30 inches (76 cm) of snowfall, which stands as the most dating back to the start of snowfall recordkeeping in 1928. In addition to snowfall, some years the city can be impacted by significant ice storms. Cold air wedging up on the east side of the mountains can lock this part of the state into cold air while warmer moist air moves in aloft. This proximity to the mountains creates what is known as the Appalachian Wedge and can produce crippling ice storms. High Point was one of several communities impacted by a 2010 tornado outbreak. The twister reached its most powerful EF3 classification as it crossed the northern suburbs of the city. In 1989, High Point sustained minor wind damage from Hurricane Hugo as it raced through the western Piedmont region of North Carolina after making landfall 5 hours away in Charleston, South Carolina. As of the census of 2000, there were 85,839 people, 33,519 households, and 22,523 families residing in the city. The population density was 1,750.1 people per square mile (675.7/km²). There were 35,952 housing units at an average density of 733.0 per square mile (283.0/km²). The racial makeup of the city was 54.56% White, 34.77% African American, 0.46% Native American, 4.45% Asian, 0.02% Pacific Islander, 2.27% from other races, and 1.57% from two or more races. Hispanic or Latino of any race were 6.89% of the population. 12.7% were of American, 8.7% English, 8.3% German and 5.9% Irish ancestry. There were 33,519 households out of which 32.9% had children under the age of 18 living with them, 46.9% were married couples living together, 16.3% had a female householder with no husband present, and 32.8% were non-families. 27.2% of all households were made up of individuals and 9.5% had someone living alone who was 65 years of age or older. The average household size was 2.49 and the average family size was 3.03. In the city, the population was spread out with 26.0% under the age of 18, 9.3% from 18 to 24, 31.8% from 25 to 44, 21.0% from 45 to 64, and 11.9% who were 65 years of age or older. The median age was 34 years. For every 100 females, there were 91.5 males. For every 100 females age 18 and over, there were 87.6 males. The median income for a household in the city was $40,137, and the median income for a family was $48,057. Males had a median income of $33,411 versus $25,293 for females. The per capita income for the city was $21,303. About 10.5% of families and 13.2% of the population were below the poverty line, including 18.6% of those under age 18 and 11.4% of those age 65 or over. As of the census of 2010, there were 104,371 people, and 40,988 households residing in the city. The population density was 1,939.9 people per square mile. There were 46,677 housing units in the city. The racial makeup of the city was 53.6% white (50.4% Non-Hispanic white), 33.0% Black or African American, 0.6% Native American, 6.1% Asian, 0.0% Pacific Islander, and 2.3% from two or more races. Hispanic or Latinos of any race were 8.5% of the population. Once synonymous with furniture, hosiery, and Hatteras Yachts, High Point has diversified its economy as a center for distribution and logistics, customer service, banking, manufacturing, photography and pharmaceuticals. The High Point Market remains a centerpiece to High Point's economy and the city's most recognized industry. Its bi-annual trade show is the largest furniture and furnishings industry event in the world. It is held in April and October of each year. Approximately 12,000,000 square feet (1,100,000 m2) of showroom space is used by 2300 exhibitors, in 188 separate buildings. Over 100 countries are represented through both vendors and visitors. High Point was an early center for the development of the furniture industry in the South. Functional furniture had been produced on a small scale since the 17th century by artisans of English ancestry who had settled in North Carolina. As the farming landscape of the South began to change with the end of the Civil War and slavery, cheap labor became available during the Reconstruction Era. The North Carolina furniture industry gained momentum in the late 19th century, and developers were attracted to High Point for its location, transportation, and cheap labor. The city was situated ideally in the center of the Piedmont region with access to vast hardwood forests in the central and western parts of the state. High Point, located at the junction of the railroad and a main state road, was an ideal centralized shipping point for the southern market. An agricultural depression of the 1890s drove farm workers from the countryside to developing towns like High Point looking for industrial jobs. Upholstering at Tomlinson Chair Manufacturing, circa 1936. Photo by Lewis Hine. Factories were needed to produce affordable wooden household furniture for the southern market. The first furniture company, the High Point Furniture Manufacturing Company, was formed in 1889. Subsequently, from 1890-1900, 38 new furniture factories opened in the state, with 13 of those in High Point. The Southern Railway line was formed in 1894, and High Point was shipping eight fully loaded freight cars of furniture each day by 1898. By the turn of the century, High Point had become the leading furniture center in the South, with over 40 furniture companies located within the city and the surrounding area. Meanwhile, other manufacturers set up local factories to provide related products like veneers, plate glass, mirrors, paint, and locks to furniture companies. The large profits in the North Carolina furniture industry lessened with the increasing number of factories. In addition to the increased competition for market shares, by 1910 the salary for competent experienced workers and rising shipping costs had cut further into the profit. Bankruptcies resulted from inexperienced managers who tried to sell products below the cost of production and companies that tried to expand too quickly. An innovative High Point company, Tomlinson Chair Co., devised incentives to give its workforce an opportunity to receive part of the profits. The company was one of the first to manufacture quality period reproduction dining and living room furniture on a large scale; an employee who exceeded a monthly quota received a percentage bonus. All workers received a life insurance policy as well. Marketing became important to the phenomenal rise of the furniture industry in North Carolina in the twentieth century. Store owners had to visit the factory to select their orders due to the large size and weight of the furniture. This situation improved at the turn of the century with the mass marketing and sales of North Carolina furniture from the catalogues of Sears Roebuck and Co. At the same time, competitors in large cities like New York and Chicago held a national exposition twice a year to display the manufacturers' products and to take orders from furniture dealers and buyers. Recognizing the need for a more convenient southern location, High Point furniture manufacturers began planning for an exposition to display and sell their product to the public. The first North Carolina furniture exposition was held in High Point in 1905. In 1921, a brand new Southern Furniture Exhibition Building was built with ten stories and 249,000 square feet (23,100 m2) at a cost of $2 million. The event that became known as the High Point Furniture Market was attended by 700 buyers and generated $2.25 million in sales. High Point had overtaken Chicago as the site of the nation's most important semi-annual furniture show. Gradually the High Point Furniture Market, held in April and October, has grown into an internationally renowned furniture trade fair for all home furnishings. High Point continues to be the prime location in the United States to purchase brand-name furniture at a substantial discount. The furniture industry and developing textile manufacturing set the pace for two 20th century growth booms in High Point. Over the decade of the 1920s, the population grew from 14,302 to 36,745 as $20 million of building permits were issued and $26 million was spent on city improvements. The Great Depression did not seem to affect the southern furniture market which produced trendy and affordable furnishings as much as those in the North that produced traditional, luxurious products. Rebounding by 1935, North Carolina was second only to New York in US furniture production. Meanwhile, the High Point Market continued to set furniture trends and to be a national economic indicator; the $5 billion in sales in 1947 after World War II forecast a postwar boom. The 1950s' growth of the furniture market mirrored that of High Point's second population boom from 39,973 in 1950 to 62,063 in 1960. By 1959, North Carolina had become the state employing the most people in the furniture industry, beating out New York. In 1961, The State magazine declared that "High Point, in Guilford County, is the world's leading manufacturing center of wood furniture. It is also the location of one of the nation's principal furniture markets." Four international furniture shows were being hosted by High Point at that time, including the High Point Market (still known then as the Southern Furniture Exposition), which The State reported was drawing crowds of five to six thousand buyers. Throughout the end of the 20th century, North Carolina continued to lead the nation in the production of both upholstered and wooden household furniture. The furniture was slightly styled and inexpensive, to meet the needs of all income levels, but lost its regional characteristics. Some local artisans still maintained a unique and high quality wooden product. High Point became known as the "Furniture Capital of the World" in the 1980s during the golden era of North Carolina furniture manufacturing. The globalization of the 1990s opened free trade and competition from foreign furniture manufacturers. US companies, unable to compete, began outsourcing to Latin America and Asia. China became the leading manufacturer by producing furniture of equal quality at a lower price. The majority of furniture companies in North Carolina have continued to close since the 1990s. The furniture makers who have maintained a high quality product made from solid wood continue to maintain a unique niche and are sold in both the United States and Asia. The High Point Museum showcases an exhibit, "High Point's Furniture Heritage", which examines the historical relationship between the furniture industry and the people of High Point. The Bienenstock Furniture Library located in downtown High Point is the largest furniture specialty library in the world and contains over 4,000 furniture and design-specific volumes. The High Point Market has been noted for being a significant part of the region's larger furniture "cluster", which was discussed most recently by sociologist Richard Florida and initially by economist Michael Porter. The Market and its effects on the city have also been the focus of an extensive case study by urban sociologist John Joe Schlichtman. In this research, High Point's ability to capture the global furniture merchandising market is said to signal a new era in what is possible for small cities. Along these lines, Schlichtman terms High Point a "Niche City", which is "a city that forges global centrality by creating an economic specialization in a specific segment of the global service economy." In 2005, High Point adopted "North Carolina's International City" as its official slogan, emphasizing the role of international business and especially the High Point Market (formerly called the International Home Furnishings Market), the largest furnishings industry trade fair in the world. Since 2005, the High Point Market has been receiving increasing competition from the huge World Market Center project in Las Vegas, which, if fully built according to its multi-stage plan, is slated to exceed the High Point Market in square footage. In February 2011, speculation developed that Las Vegas World Market Center interests were positioning to purchase a controlling stake in the High Point Market. If this speculation is correct, World Market Center interests would control 64% of the square footage in downtown High Point. Amtrak's Crescent, Carolinian and Piedmont trains connect High Point with the cities of New York, Philadelphia, Baltimore, Washington, Richmond, Raleigh, Charlotte, Atlanta, Birmingham and New Orleans. The recently refurbished historic High Point Amtrak station is situated at 100 West High Street. Interstate 85 runs through southern High Point, southeast of the original interstate roadway, which is now designated Business 85. The new Interstate 74 runs north and east of the city. This section is referred locally as the "East Belt" freeway project, and was completed southeast to I-73/US 220 near Randleman in 2013. To the northwest it extends to Interstate 40 in Winston-Salem. It is co-signed with U.S. Highway 311 for most of the route. The Piedmont Authority for Regional Transportation (PART) operates in High Point. It is a service that shuttles people between most of the cities in the northwestern Piedmont region of North Carolina. The main service for public transportation in High Point is Hi tran, the local bus service. Private schools for children were established in and around High Point as early as the early nineteenth century by Quakers. The New York Yearly Meeting of the Society of Friends, a network of Quakers from that state, started a school in Asheboro in the 1880s for African American students. The school relocated to High Point in 1891 on land east of town on Washington Street. The institution was named the High Point Normal and Industrial School (later William Penn High School), and was administered by the Quakers until 1897. In that year, black educator Alfred J. Griffin accepted the position of principal and led the establishment into a long period of growth. The High Point public school system was founded in 1897 with the approval of a $10,000 bond, in part to finance the purchase of J. Elwood Cox's family home on South Main Street for use as the first school building. Twelve school commissioners were appointed to administer the 350-student system of five grades. Growth of the city's institutions reflected improved primary educational facilities. A school building campaign coupled with additional grades and improved classes resulted in four additional schools for white students: Elm Street School (1905), Park Street School (1910), Fairview School (1910), and Grimes Street School (1911). Many other schools were born in the 1920s during a period of rapid growth. This building spree culminated in 1927 with the opening of High Point High School. Among the many high styled school complexes in the state, few surpass High Point's grand 1927 high school. The campus joined the talents of two designers, Greensboro architect Harry Barton and Charlotte landscape architect Earl S. Draper. The building was matched in 1931 with the addition of Ferndale Middle School just to the east, designed to incorporate details from the high school so that it maintained a campus theme. Both shared athletic facilities on a large tract of land between downtown and Emerywood. In 1962, High Point High School's name was modified to High Point Central High School when an additional high school, T. Wingate Andrews High School, was established in the 1960s. Several private and independent schools are found in High Point, including High Point Christian Academy (Baptist), High Point Friends School (Quaker), Immaculate Heart of Mary (Catholic), Wesleyan Christian Academy (Wesleyan), and Westchester Country Day School (nonsectarian), and Phoenix Academy, a charter school. In 1921, the Chamber of Commerce made the establishment of a college in High Point a high priority and initiated a High Point College campaign. The campaign solicited funds in order to attract the attention of the North Carolina Methodist Protestants, who had desired for decades to found a college. High Point succeeded in attracting the college over rivals Greensboro and Burlington with a gift of 60 acres (24 ha) and $100,000 in pledges from leading citizens. High Point College opened in 1924 (changed to High Point University in 1991) with three buildings at various stages of development. Many of the numerous civic organizations founded in the 1920s pledged funds, including the Rotary, Kiwanis, Civitan, and the American Business Club. The architectural design of the High Point College campus was in keeping with traditional and historical architectural initiatives found at many private colleges and universities across the state in the 1920s. The administration building (Roberts Hall), male and female dormitories (McCulloch Hall and Women's Hall, respectively), and a central heating plant were all erected between 1922 and 1924 according to designs by Washington, D.C. architect R. E. Mitchell with assistance by High Point architect Herbert Hunter. Today, High Point University is a four-year, coeducational, liberal arts university related to the United Methodist Church. It offers 50 majors in a traditional day format. It also offers non-traditional evening programs, and the graduate studies program offers 10 master's degrees and one doctorate degree. High Point is also the home of Laurel University, as well as one of the nine Shaw University "CAPE" (College of Adult and Professional Education) program centers. Guilford Technical Community College maintains a High Point campus. Providence Bible College & Seminary (Baptist) operates in High Point, offering degrees from Bible Diploma to Doctorate Degree. The High Point Enterprise, established in 1885, is the only daily newspaper published in High Point. HP Magazine is a full-color glossy lifestyle magazine that offers stories on food, history, events, the furniture industry, and more. The monthly magazine is the city's largest locally owned publication. Greensboro's News & Record is available in High Point. Triad City Beat, Yes! Weekly and the Rhino Times are free weekly papers covering High Point. High Point makes up part of the Greensboro/Winston-Salem/High Point television designated market area. These stations are listed by call letters, channel number, network and city of license. Bernice Bienenstock Furniture Library: World's largest collection of books on the history of furniture and interior design. Home of the Pat Plaxico Sculpture Gardens. Brentwood Baptist Church was built in 1964 to the designs of Lawrence Henry Mallard of Lawrence Henry Mallard, 17041 Battleground Ave, Greensboro, North Carolina 27408. Castle McCulloch Gold Mill: McCulloch Gold Mill was built in 1832 and operated primarily as a gold processing center serving local gold mining operations. Now open as a special events center. High Point City Lake Park: Recreation and amusement park located on the shores of 540-acre (2.2 km2) lake with boating, fishing, paddle boats, picnic areas with shelters, fishing boat and canoe rentals, historic carousel, train, waterslide, largest outdoor swimming pool in the state, miniature golf, gymnasium, playground and excursion boat. Site of annual "Day in the Park" festival each September. High Point Community Theatre: Founded in 1976, High Point Community Theatre (HPCT) presents American musicals, dramas and comedies performed by local actors. HPCT also has an education program, featuring classes, workshops and camps for adults, youth and children. High Point Museum and Historical Park: Museum commemorating the history of High Point, coupled with interpretative exhibit of log Blacksmith Shop and 1786 Haley House. High Point Public Library: A massive full-service public library contains nearly 400,000 books, music recordings, videotapes, audiobooks, periodicals, newspapers, and a comprehensive collection of books related to history and genealogy equipped with many attractions for Youth and Young Adults. Millis Regional Health Education Center: Interactive health education center with features depicting facets of human anatomy and health. Museum of Old Domestic Life: Quaker museum established around 1926 in 1858 Springfield Meeting House, containing a broad selection of artifacts from typical colonial Quaker homesteads. Piedmont Environmental Center: Features 375 acres (1.5 km2) of hiking trails adjacent to High Point City Lake, nature preserve, small animal exhibits, the North Carolina Mapscape, and access to an eight-mile (13 km) Greenway Trail. Rosetta C. Baldwin Museum: The museum was created in November 2000 to honor the legacy of Miss Rosetta C. Baldwin, her family and many African-Americans. The site depicts a typical home of a southern African American family during the mid-twentieth century. Sechrest Gallery: Located on the campus of High Point University in the Hayworth Fine Arts Center, the Sechrest Gallery houses permanent collections of 18th and 19th century British Art coupled with rotating exhibitions. Theatre Art Galleries: Housed in the High Point Theatre since 1975, the Theatre Art Galleries (TAG) hosts exhibitions of contemporary visual art. TAG has been the sole independent nonprofit provider of the visual arts in High Point and includes one of the finest stage and gallery spaces in the Southeast. World's Largest Chest of Drawers: Iconic symbol of the city since 1926, the World's Largest Bureau is an example of automobile-oriented pop architecture and has been featured on numerous broadcasts such as MTV and The Travel Channel. BB&T Point: a baseball park under construction for the High Point Rockers in the Atlantic League of Professional Baseball. Edrice Adebayo, attended High Point Christian Academy, College basketball player for the Kentucky Wildcats. Susie, the Dog, rescued part pit bull puppy who was set on fire and terrorized in 2009 by the boyfriend of its original owner. ^ "Welcome to High Point NC". City of High Point. Retrieved November 25, 2015. ^ a b "Geographic Identifiers: 2010 Demographic Profile Data (G001): High Point city, North Carolina". U.S. Census Bureau, American Factfinder. Retrieved November 25, 2015. ^ "National Register of Historic Places Listings". Weekly List of Actions Taken on Properties: 1/07/13 through 1/11/13. National Park Service. 2013-01-18. ^ "National Register of Historic Places Listings". Weekly List of Actions Taken on Properties: 8/27/12 through 8/31/12. National Park Service. 2012-09-07. ^ "National Register of Historic Places Listings". Weekly List of Actions Taken on Properties. National Park Service. 2014-05-30. ^ "County Maps". City of High Point, North Carolina. Retrieved 1 February 2017. ^ "High Point, North Carolina". Weatherbase.com. Canty and Associates LLC. Retrieved November 19, 2011. ^ "Population and Housing Unit Estimates". Retrieved July 1, 2017. ^ "High Point Market". High Point Market. Retrieved 2015-12-24. ^ Bienenstock Furniture Library, retrieved 3/22/2013. ^ a b Houser, John A. (July 7, 1961). "First in Nation". The State. 29 (3): 13. ^ Michelle Abbott, "Urban Sociologist Studies High Point, N.C.'s Path to Furniture Mart Prosperity," High Point Enterprise, September 2, 2003. ^ John Joe Schlichtman, "Making Temp Town: The Political and Economic Machinations of the Furniture Capital of the World." Small Cities: Urban Experience Beyond the Metropolis, Routledge. 2006. ^ Paul Johnson, "SHOWROOM DEAL: Report raises possibility of mega pact involving High Point, Las Vegas," High Point Enterprise, February 1, 2011. ^ "City of High Point CAFR" (PDF). Archived from the original (PDF) on May 9, 2013. Retrieved November 17, 2011. ^ "College of Adult and Professional Education (CAPE)". Shaw University. Archived from the original on 2008-12-01. Retrieved 2008-06-02. ^ "Herbert F. Maddalene Archived 2011-07-24 at the Wayback Machine" American Architects Directory, Third Edition (New York City: R.R. Bowker LLC, 1970), p.590. ^ Spedden, Zach (April 12, 2018). "New for 2019: BB&T Point". Ballpark Digest. Retrieved April 17, 2018. ^ Rose, Alex (April 11, 2018). "City leaders break ground for High Point stadium project; stadium to be named 'BB&T Point'". WGHP. Archived from the original on April 17, 2018. Retrieved April 17, 2018. ^ https://www.pro-football-reference.com/players/A/AdamSt21.htm. Pro Football Reference. Retrieved 24 November 2018. ^ https://www.basketball-reference.com/players/a/adebaba01.html. Basketball Reference. Retrieved 24 November 2018. ^ "Luke Appling Statistics and History". Baseball-Reference.com. Retrieved April 7, 2014. ^ https://www.pro-football-reference.com/players/B/BakeTo20.htm. Pro Football Reference. Retrieved 24 November 2018. ^ https://www.pro-football-reference.com/players/B/BankBr01.htm. Pro Football Reference, Retrieved 24 November 2018. ^ "Top Contestants - Season 3 - American Idol". American Idol. Archived from the original on April 20, 2014. Retrieved April 19, 2014. ^ http://www.thebaseballcube.com/players/profile.asp?ID=10389. The Baseball Cube. Retrieved 24 November 2018. ^ https://www.pro-football-reference.com/players/E/EvanJo21.htm. Pro Football Reference. Retrieved 24 November 2018. ^ http://www.thebaseballcube.com/players/profile.asp?ID=11515. The Baseball Cube. Retrieved 24 November 2018. ^ https://www.pro-football-reference.com/players/G/GilcMa00.htm. Pro Football Reference. Retrieved 24 November 2018. ^ https://www.pro-football-reference.com/players/H/HayeWi99.htm. Pro Football Reference. Retrieved 24 November 2018. ^ "Baseball Reference.com". Baseball Reference.com. Retrieved 2012-06-16. ^ http://www.thebaseballcube.com/players/profile.asp?ID=12578. The Baseball Cube. Retrieved 24 November 2018. ^ http://www.thebaseballcube.com/players/profile.asp?ID=12579. The Baseball Cube. Retrieved 24 November 2018. ^ https://www.pro-football-reference.com/players/J/JeffGr21.htm. Pro Football Reference. Retrieved 24 November 2018. ^ https://www.pro-football-reference.com/players/J/JohnSa00.htm. Pro Football Reference. Retrieved 24 November 2018. ^ Tomlin, Jimmy (April 6, 2014). "Things are looking up for actress — and former High Pointer — Jenn Lyon". HPE.com. Archived from the original on May 26, 2014. Retrieved May 25, 2014. ^ https://www.basketball-reference.com/players/m/millequ01.html. Basketball Reference. Retrieved 24 November 2018. ^ https://www.basketball-reference.com/players/p/pinsoth01.html. Basketball Reference. Retrieved 24 November 2018. ^ "Heather Richardson". Sports Reference, LLC. Archived from the original on December 14, 2012. Retrieved September 11, 2012. ^ "Susie, abused dog that inspired NC law, nominated for award". myfox8.com. June 24, 2014. Retrieved August 10, 2014. ^ https://www.pro-football-reference.com/players/W/WillBr22.htm. Pro Football Reference. Retrieved 24 November 2018. ^ https://www.sports-reference.com/olympics/athletes/wi/harry-williamson-1.html Sports Reference, LLC. Retrieved July 9, 2018. ^ http://www.thebaseballcube.com/players/profile.asp?ID=223. The Baseball Cube. Retrieved 24 November 2018. Wikivoyage has a travel guide for High Point. Wikimedia Commons has media related to High Point, North Carolina. This page was last edited on 25 March 2019, at 00:29 (UTC).